Looking for an easy way to weave some math practice into your day? 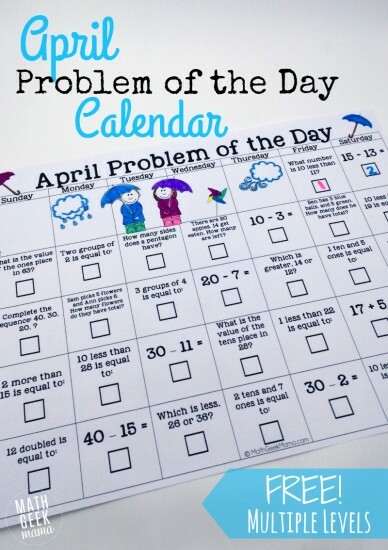 This April Problem of the Day calendar from Bethany at Math Geek Mama is fun and simple to use! Each day of the month there is a new math problem for kids to solve. The fun twist is that the solution is equal to the date! The calendars are black and white for easy printing, and come with two different versions for kids in grades K-2 and 3-5. This would also make a fun resource to send home to parents to equip them to do some math at home each day!